Most deer hunters are now hunting from tree stands. If you are new to deer hunting, or if you have been hunting for a while but have yet to use this method, you should consider using a tree stand. 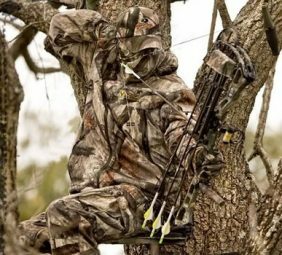 The benefits of using a tree stand are that you will stay out of the deer’s range of view, you will keep your scent hidden from the deer, and you will increase the range of your view. You do need to take certain precautions, however, to make sure that you protect yourself. There are many types of stands and most are safe to use. Some of these include ladder-type stands, climbing stands, and lock-on stands. You can also nail boards to a tree. No matter what type of stand you are using, know that accidents can happen. If a stand seems unsafe to you, do not use it. If you are thinking about using a new tree stand and you are far from your home or from people in general, wait. You would be unable to notify anyone in the event that you were injured. Do not take using a tree stand lightly. You will benefit by becoming familiar with some of the ways by which hunters injure themselves on or around tree stands. Accidents happen when hunters fall asleep. It happens more often than you would imagine. Hunters also get injured when they slip while climbing in or out of a tree stand. You cannot avoid things like excess moisture on your boot, or an exceptionally damp step. The third way by which hunters suffer injury using tree stands is having a piece of equipment break. Nothing is 100% dependable. The best way to avoid severe injury from these unfortunate events is to wear a safety harness. Many hunters know the risk of not using a safety harness, but they still use tree stands without one. Your safety harness will only help you if you wear it. It is not good enough to put on the harness after you have settled into your stand. Climbing into or out of your stand is when you are most likely to be hurt, so you need to be wearing it before you begin ascending your tree stand. It only takes a minute to secure and is well worth the hassle. The damage done by a fall with a safety harness is minimal compared to one without. The safety harness will mean the difference between a few bruises and a premature death. There are a few additional steps you need to consider while preparing to use a tree stand for the first time. Tree steps and tie-on ladders are two favorite methods used by hunters. Some also use large nails as steps. If you are looking to cut costs, go with the nails. They are cheaper than the ladders. Test the nail to make sure that it is strong, steady, and secure. Use nails that will fully support your weight. When nails bend, hunters slip and injure themselves. Use a drill to make pilot holes for the nails. Some hunters prefer to use climbing stands instead of nails, but they are more expensive and limit you to certain trees. Consider using a tree stand as you hunt. It is an effective way to catch your prey off-guard. Both your body and your scent are in the deer’s vicinity. It also allows for a broader view as you study the landscape. Tree stands do cause accidents, though. Take all the necessary steps to prevent any major injuries. Use a safety harness to shorten the distance of your fall. Make sure that the nails you use to climb the tree are secure. 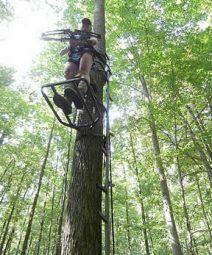 Following these steps for using a tree stand to make sure you have a safe and pleasurable hunting experience.